In Suitest there are two primary modes of using a device: automated and interactive. Automated mode is designed for unattended execution of many test automation scenarios on many devices. Interactive mode is designed for operating a single device and to experiment with a test on that device. Test tags - One or more tags to look up the scenarios. Scenarios containing any of the mentioned labels will be included into this test pack. App configuration - select app configuration with which you wish to run these tests. 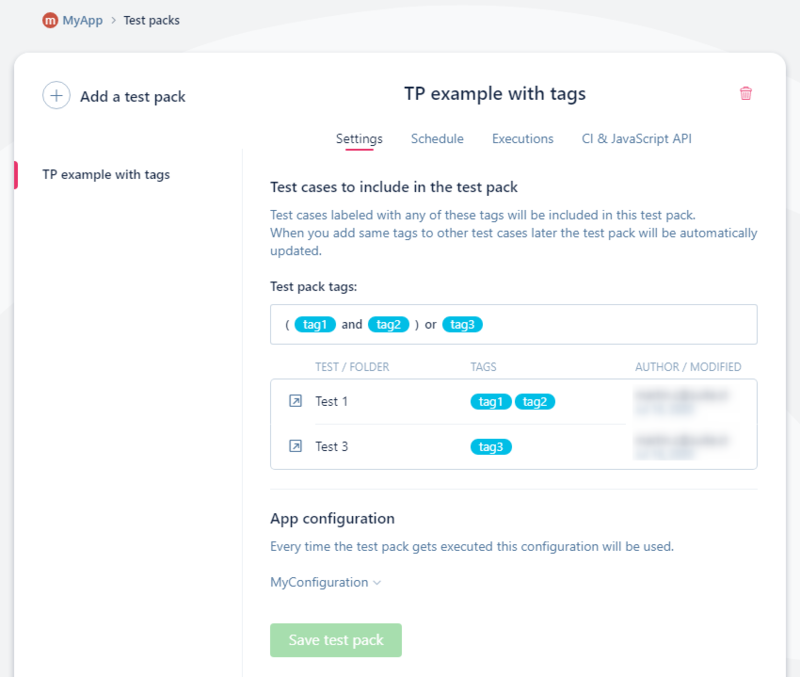 Every time you add or remove tags in a test scenario the test packs are automatically updated to include (or exclude) this test scenario. The already planned executions will however remain unaffected. 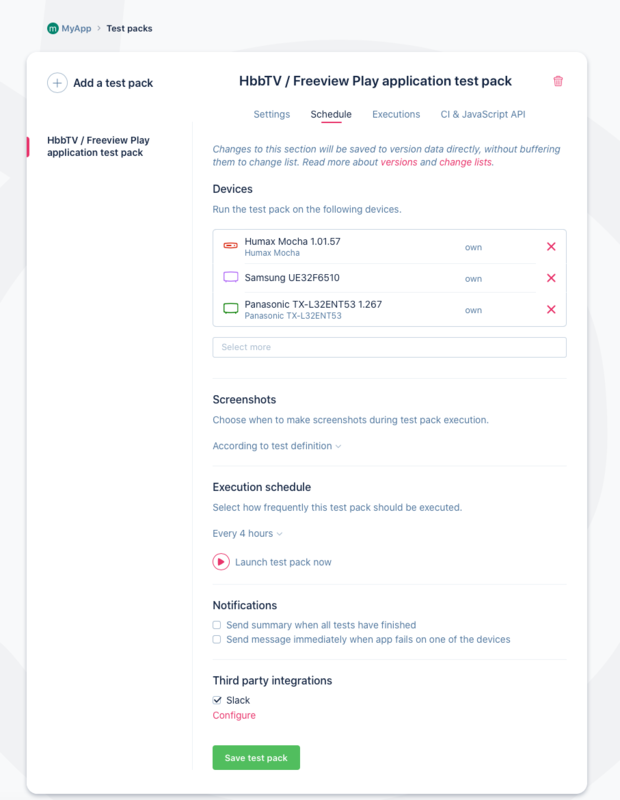 Devices - select devices on which the tests should be executed. The devices need to support the platform specified by the selected configuration. Execution schedule - select the time when to start executing these tests. Please note, however, that the tests will be planned for execution at the specified time. If some of the target devices will be busy or offline the execution on those devices will resume after they will become operational. Notifications - select the type of notification and specify email recipients to where to send the notification. Additionally you can send a notification to a predefined Slack channel. Scheduled test packs use only the applied changed assets. All unapplied changes in the version are ignored by the scheduled test packs. Test packs for tests created outside Test Editor have a bit different concept since the test definition is unknown to Suitest. Since Suitest makes no assumptions about the test runner you are about to use, it would not know that the API calls 1 and 2 belong to one test while 3 and 4 belong to the other. You can hint Suitest that you begin execution of a new test in your test suite with startTest() API call. Currently the execution results for test cases created with Suitest API are not stored on Suitest servers but this will be implemented in the nearest future.